Restoring order to your home doesn’t have to take days. Not all at once anyway. Today was a day of cooking in my kitchen. My son, Andy, is a great cook, but a messy one. And he uses too many anchovies. I believe that I completely cleaned the kitchen, including all of the pans, twice today. I know you envy my life. Anyway, maybe all of that cleaning inspired me, I don’t know. As I’ve mentioned before, I am in a state of editing my home. It suddenly looks too cluttered to me and outdated. 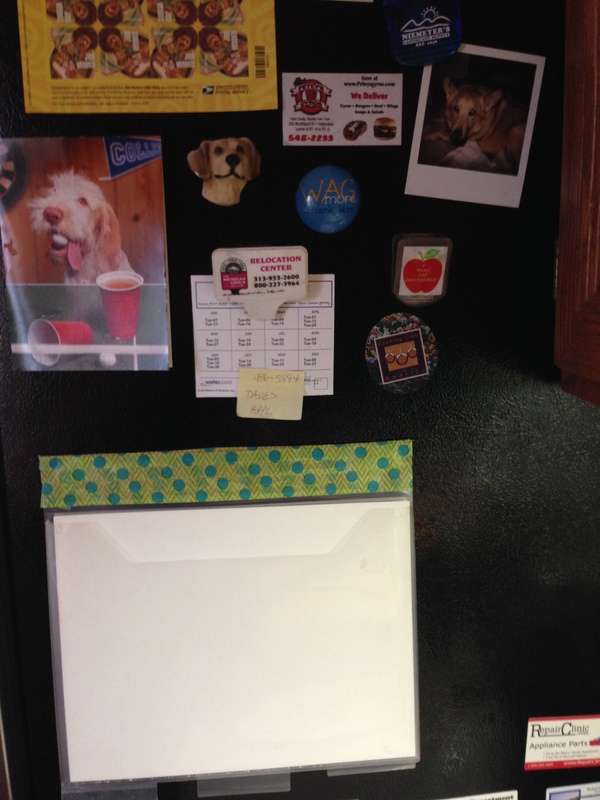 I took a look at the side of my refrigerator where all of our magnets end up and decided I could not stand it another minute. I took everything off, sorted through it, and put things where they belonged. Old recipes we never used and outdated coupons went into recycling. The birthday invitations with my grandson’s picture on them went with our photos. He turned 2 in August and I still had the one from his first birthday on the fridge. Can you tell we have a fondness for brown dogs? Oh, and my husband is a Hendrix fan. See that big white thing there? It was full of papers, including the coupons from Costco for July. It was also this ugly purple color at the top. Right now it contains 2 pieces of paper: recipes for some DIY cleaners my husband likes to use and a receipt from the music store. I covered the ugly purple with some wash tape. It took two layers to do the job. Right now I’m questioning whether it even needs to be there. What am I going to put in it? And for the record, it took me about 10 minutes to complete. Come on, you’ve got 10 minutes here and there in your day. What can you clear out?